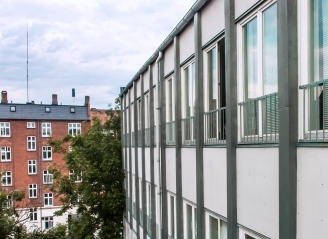 Since the bankruptcy of Sjælsø Gruppen in 2013, Mr Finn Birkjær has reclaimed the IBI.dk domain as well as the right to use IBI as a company name in Denmark. This is done on collaboration with the former director of IBI Denmark Mr Bent Friis Pedersen. The partnership between the two began as a friendship in 1982 and has since been close and productive. The business plan is now, as it was prior to the Sjælsø merge, to explore a defined part of the market where an attractive yield can be achieved. Focus will be on the value chain and to be present where effort and risk corresponds to the return. In our analysis of the market it is evident that development projects within housing poses a robustness that is not found in other sectors. 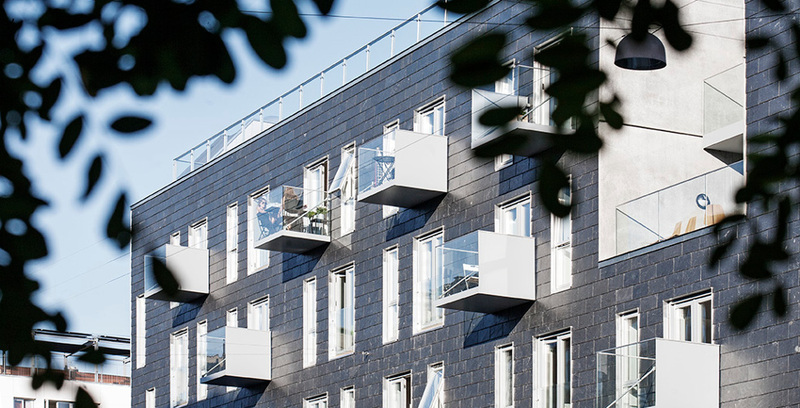 Therefore, IBI will concentrate on housing projects in the larger Aarhus and Copenhagen area, as well as in Berlin, where demand and return is satisfactory. 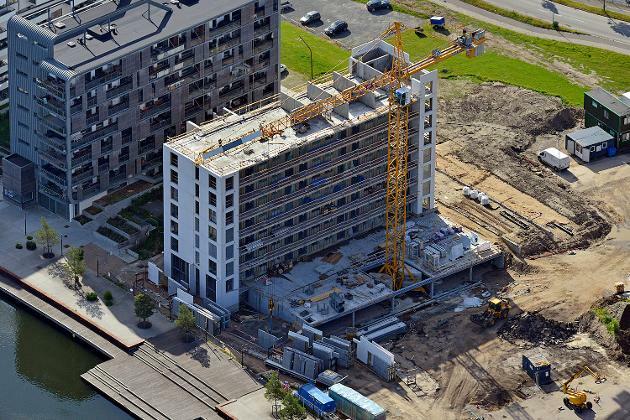 IBI will also take part in financial development of real estate projects, where we can receive part of the profit in return for financial guarantees and credits. This will be of interest where a comfortable security can match a high return. 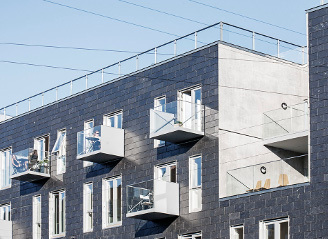 IBI – Ikast Byggeindustri A/S was founded in 1972 by Mr Jens Nørholm Andersen, and was originally a traditional construction company with its own craftsmen employed. In the course of the 80’ies and 90’ies the company developed and expanded its group of owners to include Mr Bo Olesen. 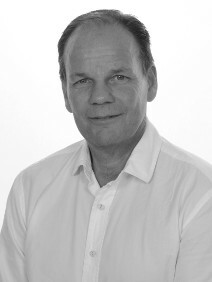 Mr Olesen influenced the company’s gradual development into focussing on turnkey contracts, employing subcontractors. IBI continued to advance, and in the end of the 90’ies a development department was founded, as the assignments grew larger. 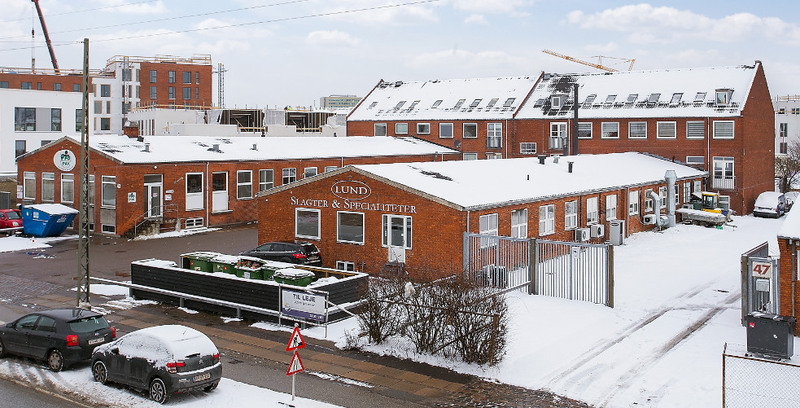 IBI concentrated on the retail market, where commercial chains in fast food, electronics, DIY construction markets and kitchen manufacturers were expanding massively, and thus experienced great growth in Scandinavia. The group of owners was expanded once more in the 00’s to include Mr Morten Lykke, Mr Finn Birkjær and Mr Stig Göte, who each in their own manner added competencies to sustain and increase the growth. 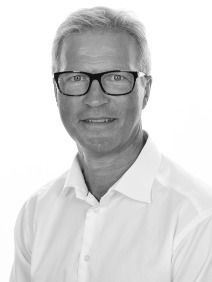 Mr Birkjær became CEO, and management could in 2005 look back upon some busy years with establishment of subsidiaries in Norway, Sweden, Finland and Poland, as well as the establishment of an IT-company. Not everything was equally successful; the Poland department was shut down and the IT company was sold, However, the growth and profits that followed made possible creating a company culture with room for innovation, new ideas and mistakes. Focus was on retail, an industry which was booming. 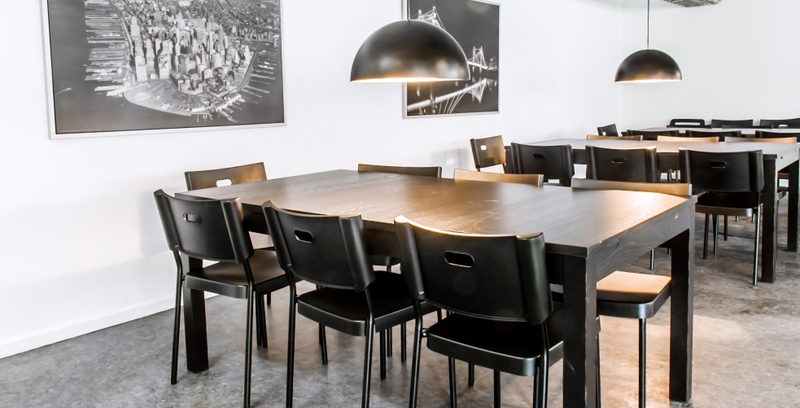 Here the company could offer locations and turnkey solutions for tenants and investors alike. IBI handled the entire process from the purchase of a plot, to regulatory permits, control of the construction process, negotiation of leases, financing and/or sale to investors. This turned out to be perfect timing. At the same time the properties, which had well established chains as tenants on long leases, could easily be sold to investors, who, with declining interest rate levels, attained attractive real estate investments. The target was that 80% of resources should be focussed on this key segment, and 20% could be allocated to new segments or markets. Throughout history IBI has always made substantial and critical decisions, which has meant increased focus on key areas. As in the 80’ies when private costumers were rejected. This segment accounted for 30% of the turnover, but by this opt-out, focus could be concentrated on the areas with the best yield. As in the start 00’s where IBI began to develop their own projects in Denmark and Sweden, thereby loosing a large costumer in the turnkey department, as they became competitors. This client at the time accounted for between 40- 50% of the turnover. Or as in 2006 when it was decided to sell all shares in IBI to Sjælsø Gruppen in recognition that the company was unable to realize their pipeline on their own capital foundation. 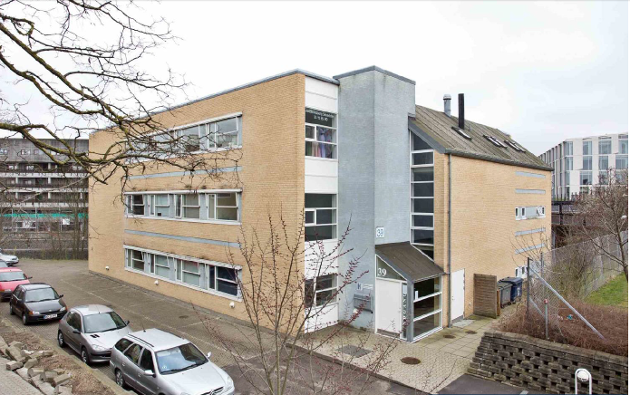 As of April 1st 2015, IBI has purchased the property situated on Bernhard Bangs Allé 39, Frederiksberg. It is an office building which currently functions as a domicile for several smaller companies. 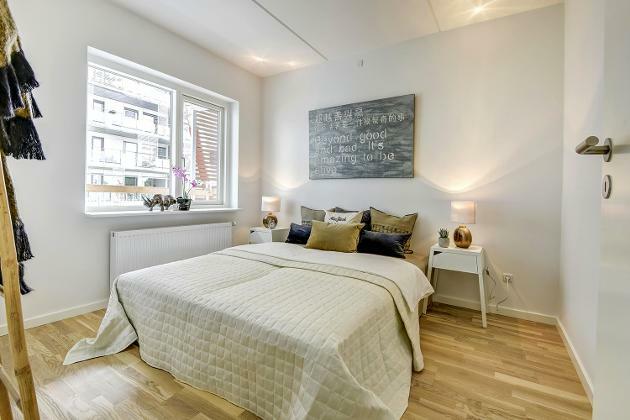 The property is located in a very attractive area, between the exclusive residential neighborhood “Femte Juni Plads” and the upcoming Flintholm-area, with many new residential and office projects. 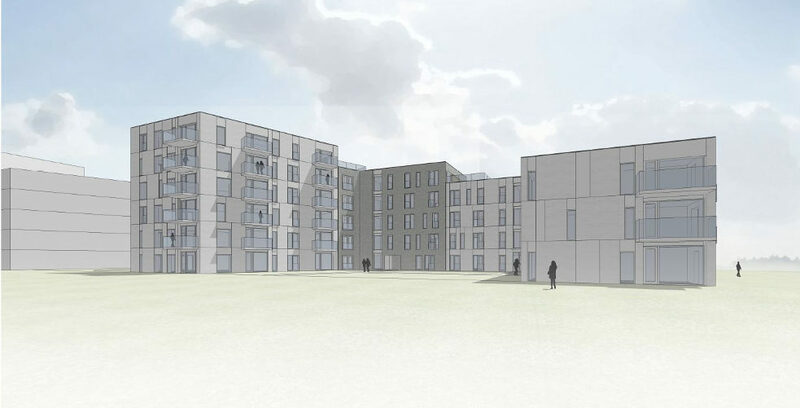 In the beginning of 2017 we will initiate the conversion of the property into student accomodation. 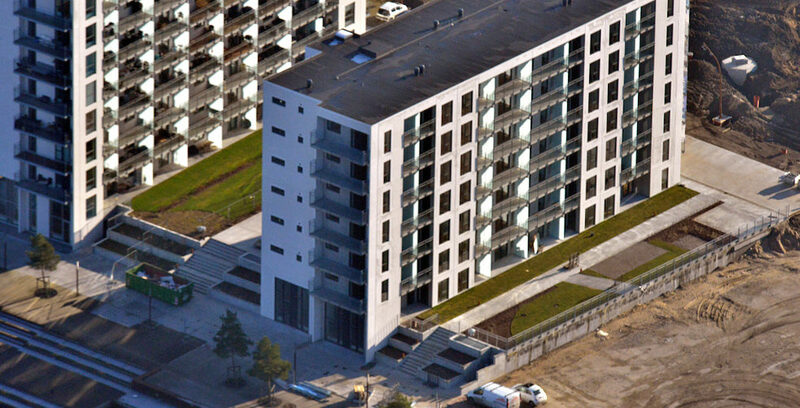 Svanekollegiet er beliggende Svanevej 4, 2400 København NV, og er et kollegium i drift siden 2011 med 48 værelser. Tre ud af fem etager udlejes til udvekslingsstuderende fra Copenhagen Business School, og de tilbageværende to etager udlejes direkte til danske studerende. Alle boligerne er 1-værelses lejligheder med eget køkken og bad og depotrum, samt adgang til fællesfaciliteter som køkken, opholdsstue og tagterrasse. Kollegiet administreres af IBI. Svanekollegiet har en central beliggenhed tæt på offentlig transport (Nørrebro station og den kommende metrostation), indkøbsmuligheder og har kort afstand til mange af de københavnske uddannelsesinstitutioner. 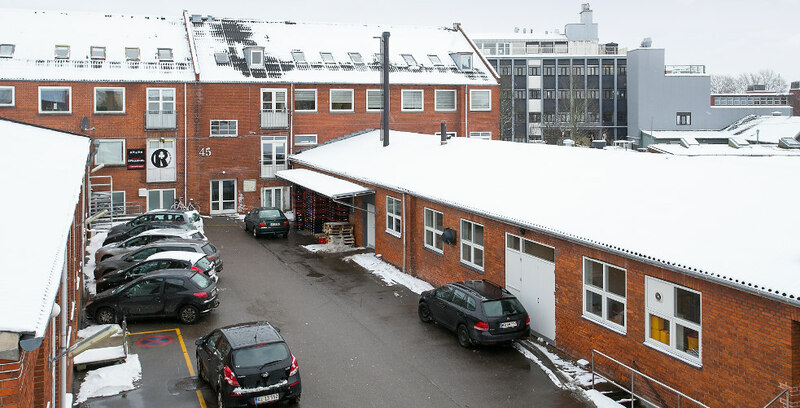 IBI has purchased the property on Lærkevej 11 i Copenhagen. 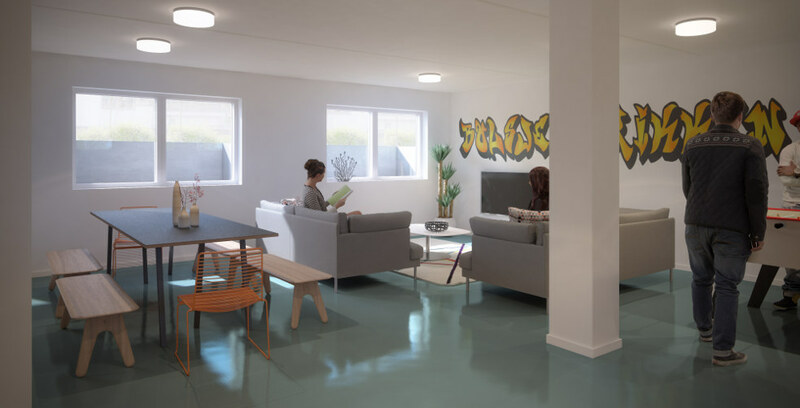 We have constructed a builidng containing 79 student apartments, all with their own kitchenette and bathroom, and cozy common areas on all floors. The property has been sold to Koncenton A/S, has sold the property to investors. 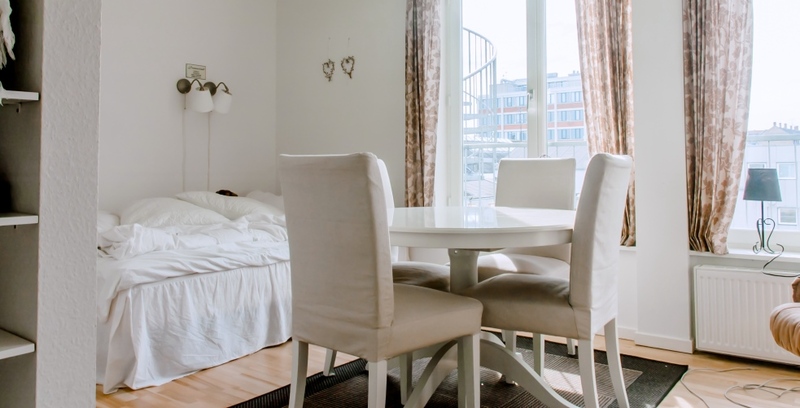 Koncenton have rented the apartment out - for students only. 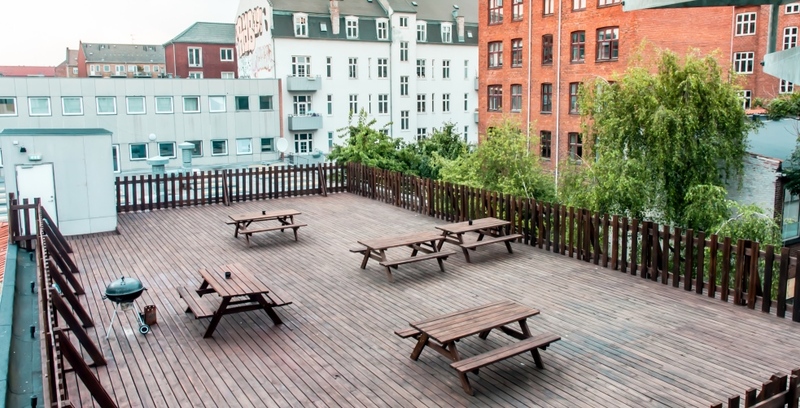 Please contact Koncenton at laerkevej11@koncenton.com if interested. 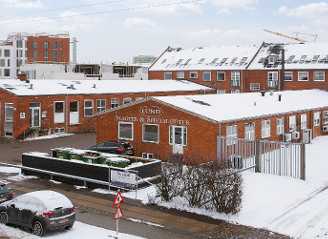 Together with Raundahl & Moesby A/S, IBI has purchased almost 27.000 sqm. of land by Odense Harbour, the area called "Promenadebyen". 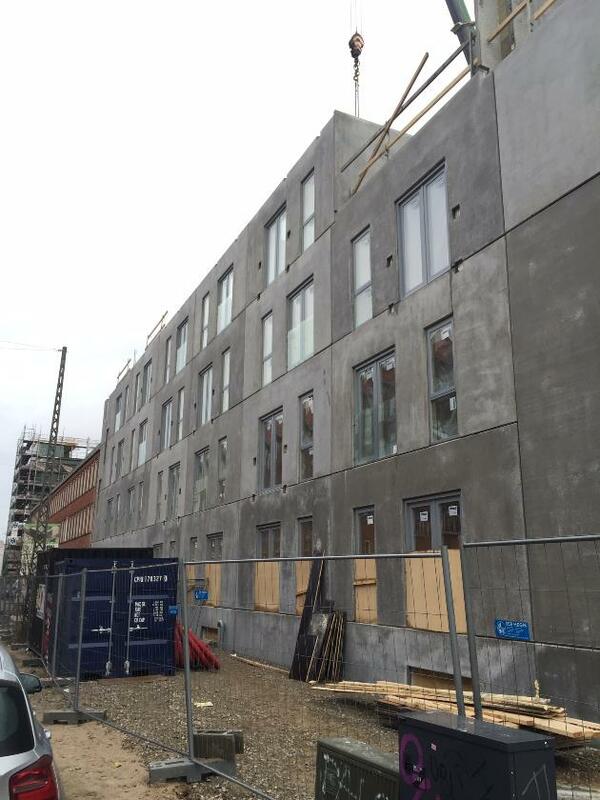 The first building "Soldækket" is currently under construction, to be completed in February 2016. 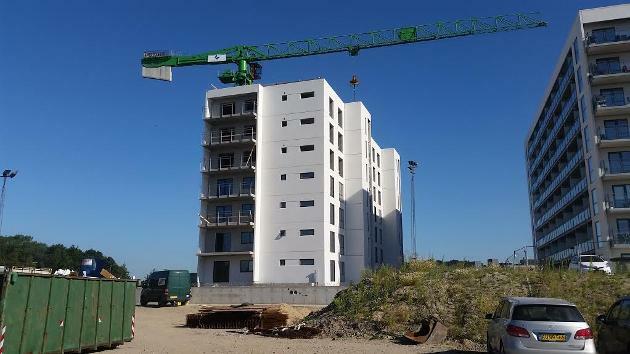 A construction permit has been given for the next building, "Mesanen", and a district plan for the remaining plot of land farthest from the habour ("BS2"), is underway. 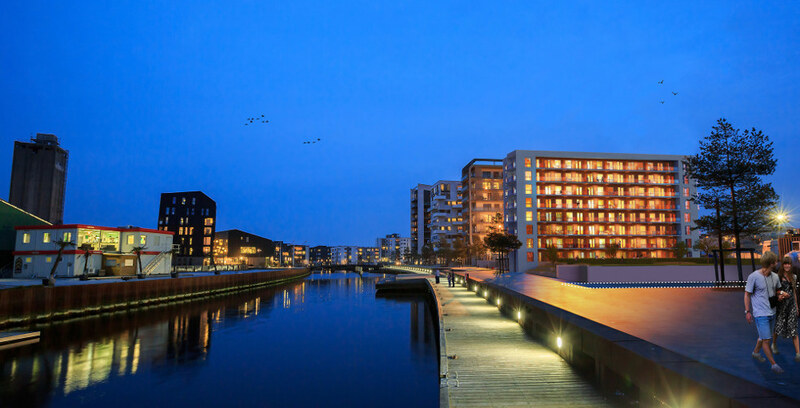 Together with Raundahl & Moesby A/S, IBI has constructed the fourth building in Promenadebyen, Odense Harbour. 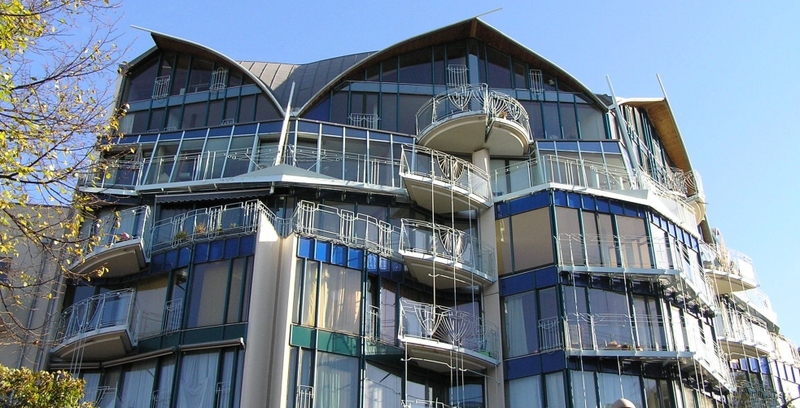 The building is the fourth in Promenadebyen, and has been dubbed "Soldækket" (The Sundeck). 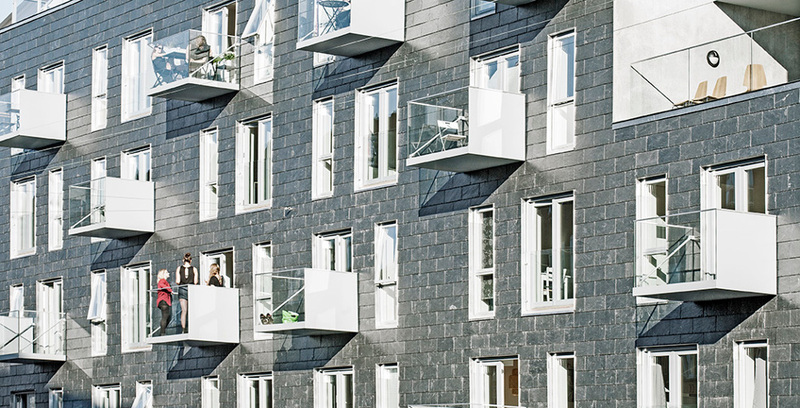 Soldækket consists of 63 apartments ranging from 62 to 82 sqm, all with balconies or terraces. 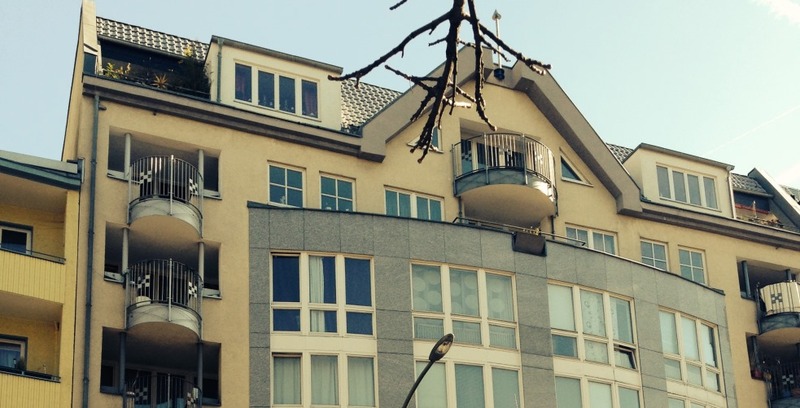 The apartments were ready for occupation in February 2016. 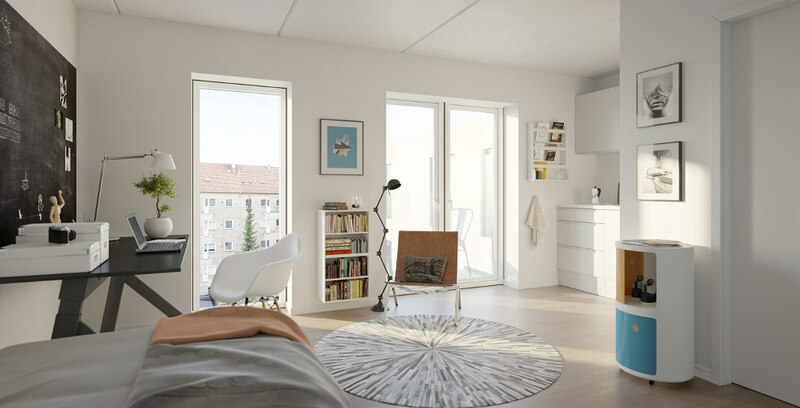 More information, pictures and floor plans can be found at www.ibi.dk/soldaekket/ (in Danish). 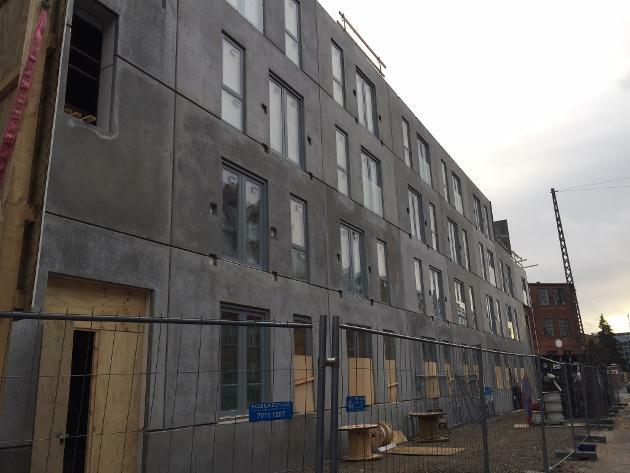 Bolsjefabrikken er ungdomsboliger under opførelse på Glentevej 10, 2400 København NV. 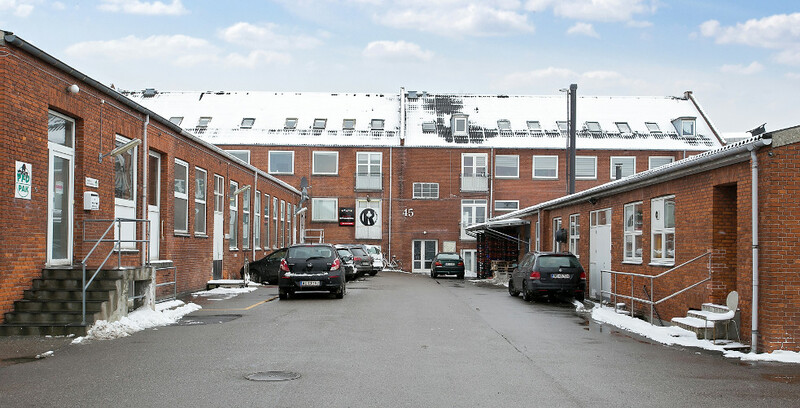 Ungdomsboligerne "Bolsjefabrikken" er opkaldt efter grundens tidligere formål, nemlig at huse bolsjefabrikken for "Nørregades Bolcher". 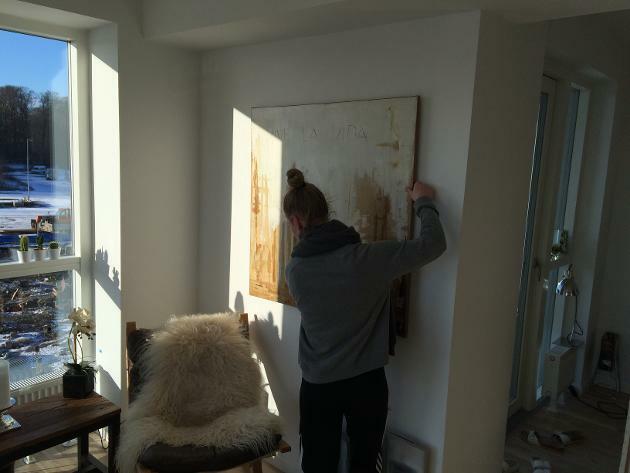 Bolsjefabrikken har i generationer haft en stor betydning for området og dets beboere, hvoraf mange har arbejdet her. Efter at produktionen blev nedlagt her, fungerede bygningerne en overgang som koncert- og kulturhus. Bygningernes sørgelige forfatning fordrede dog til sidst en nedrivning, så der nu er skabt plads til nye og spændende boliger på Bolsjefabrik-grunden. 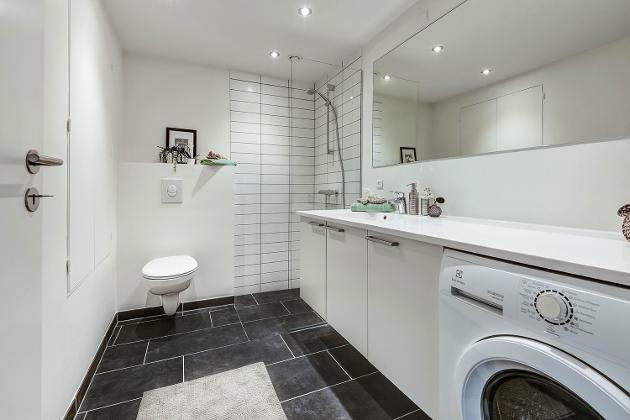 Boligerne er alle 1-værelses lejligheder med eget badeværelse og trinnette-køkken. I bebyggelsen findes der 67 lejligheder i fem etager (høj stueetage – 4. sal), hvoraf fire af disse er handikapboliger. 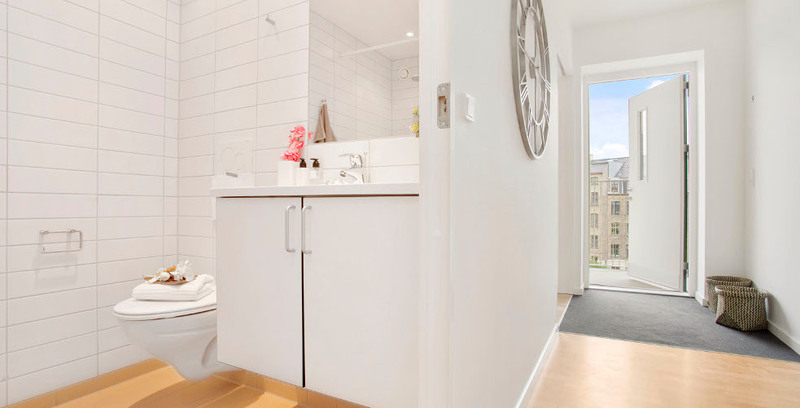 Der er gode adgangsforhold med elevator og centralt trappetårn til alle etager. Vi har med dette projekt ønsket at skabe boliger, som i særlig grad appellerer til unge mennesker under uddannelse. Boligerne er velbeliggende, udført i materialer af god kvalitet som er lette at vedligeholde, og effektivt indrettet, så kvadratmetrene udnyttes optimalt. Dermed kan prisen for disse attraktive boliger også holdes på et fornuftigt niveau, som er tilgængeligt og realistisk for studerende. 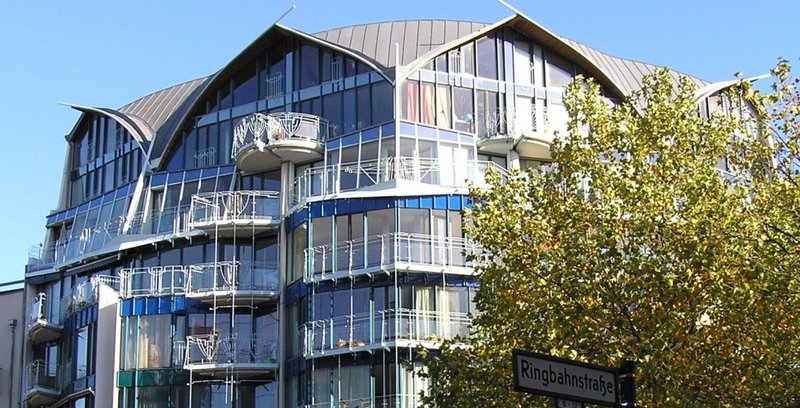 In 2008 the company purchased two very attractively located properties in the central Berlin, situated on Kurfurstendamm and Uhlandstrasse. The two properties are mixed use, accomodation and business. The properties were bought on foreclosure. 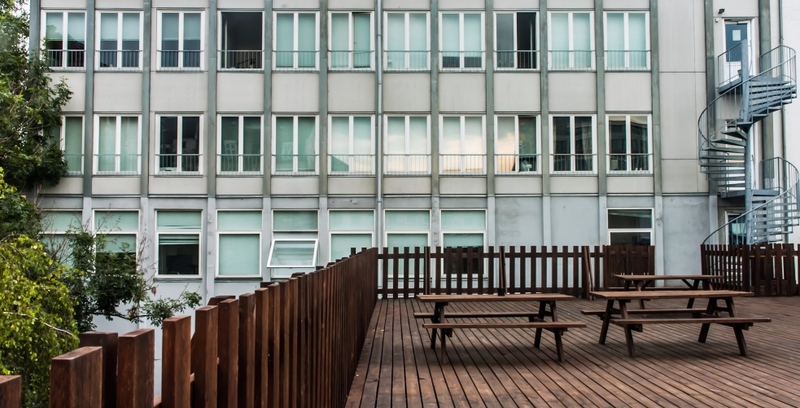 Since then, the buildings have been renovated and the mix of tenants have been optimized, thereby optimizing the operations of the properties. Both properties have from the beginning contributed positively to the company's profits. 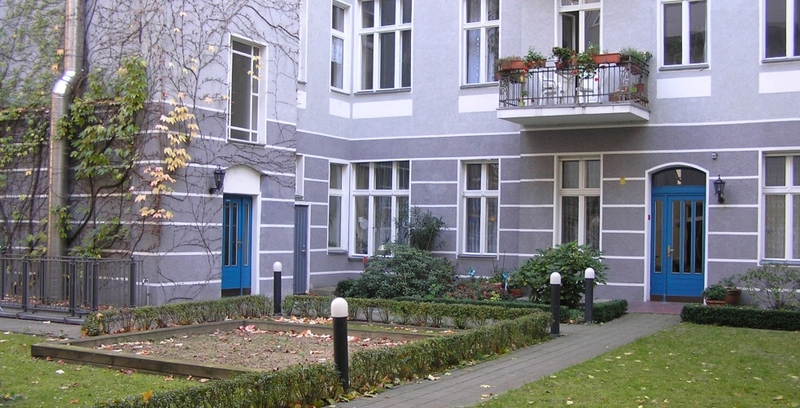 Uhlandstrasse 134, 10623 Berlin The property consists of approx. 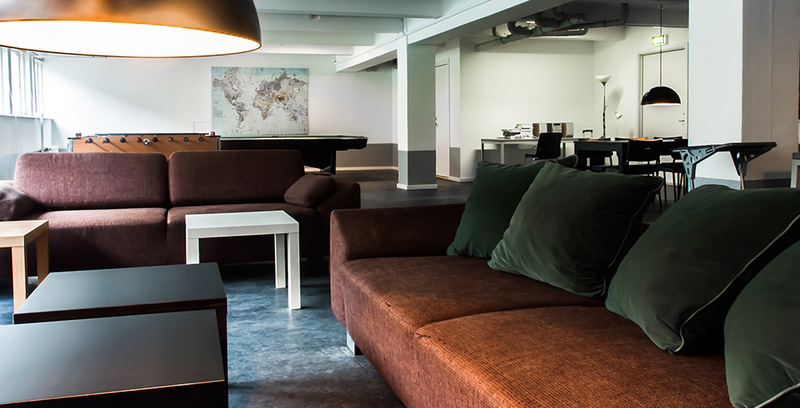 80% accomodation and 20% business (office and storage), and is 2.900 sq.m. In august 2013 the property was sold to a German investor, as we concluded that the remaining development potential in the property was long term. Kurfürstendamm 115b, 10711 Berlin The property is designed by the Danish/French architect, Professor Heinrich Baller. It is built in 1994, and hold approx. 3.550 sq.m. of accomodation and office, distributed 40/60. The property was sold to an international investor on March 1st 2015, and IBI still has an office in the building. 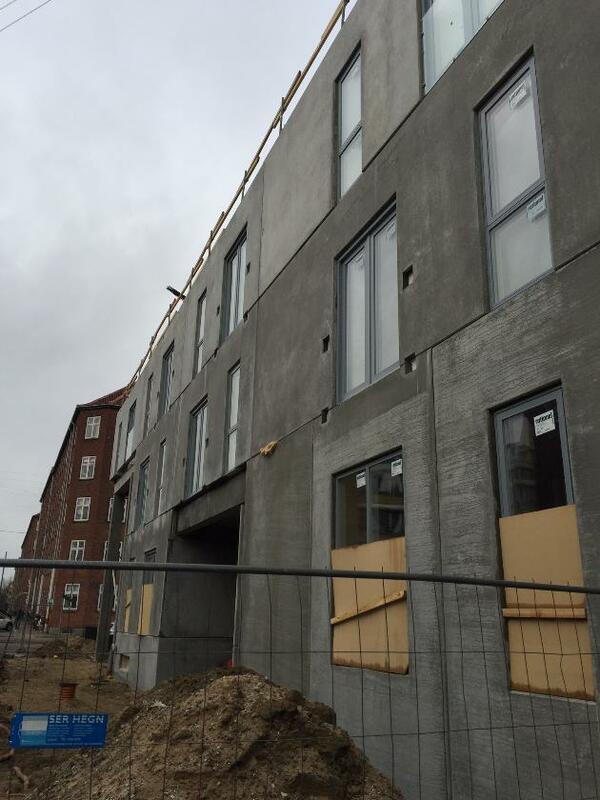 IBI is currently constructing 13 beautiful two-storey townhouses in the attractive neighborhood of the Aarhus suburd Brabrand. 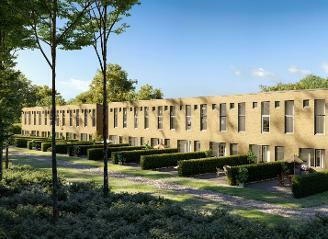 The townhouses are ready for their first residents in summer, and are now for sale. 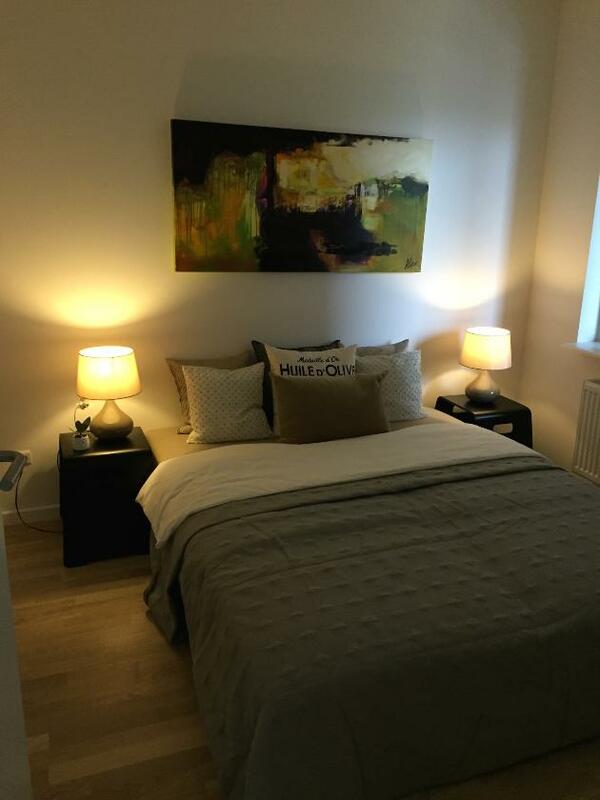 Please contact our local real estate agents for further information; Home Aabyhøj at 86152700. See the home page for the project for further visualisations and descriptions (Danish only): Maries Bakker. Please do not hesitate to contact us or Colliers if you need further information. 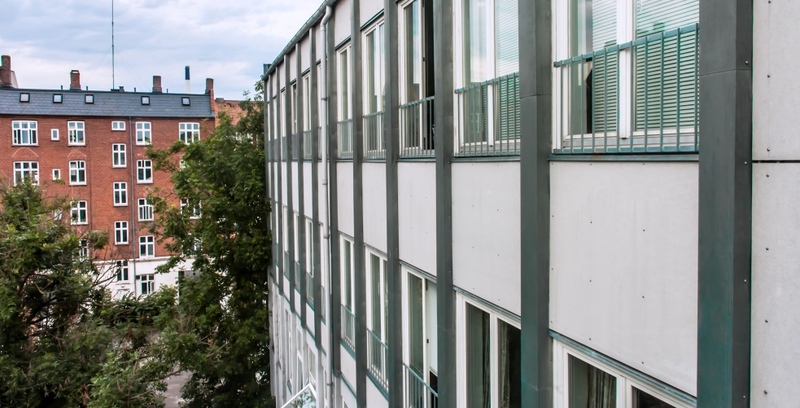 IBI has today received a construction permit for the renovation of the property on bernhard Bangs Allé 39, Frederiksberg. The work will be initiated at once, and is expected to be concluded come 2018. 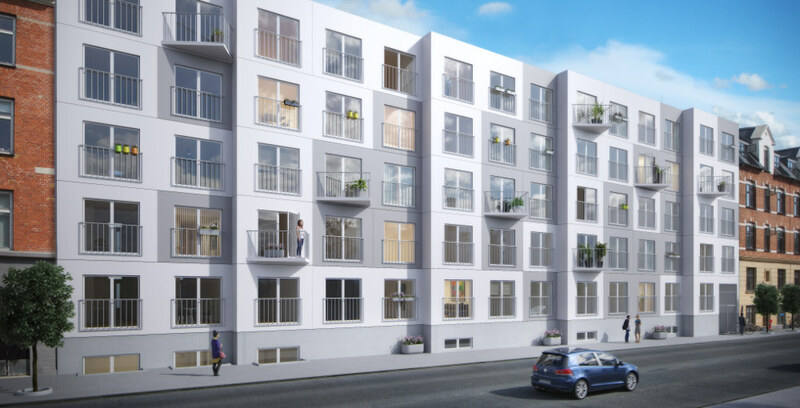 The project will, when conclude, consist of 30 apartments, replacing the current offices in the building. 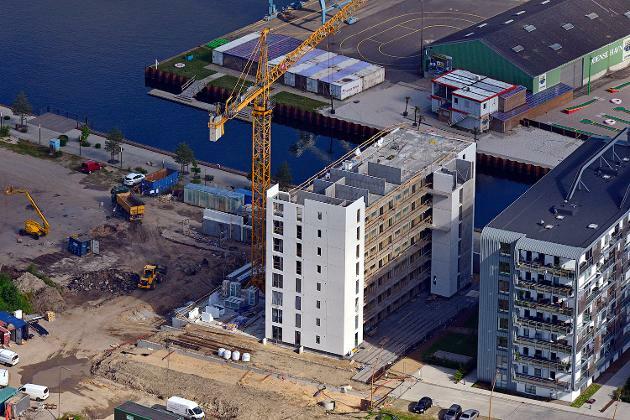 The construction of Mesanen - the fifth building at the habour front in Odense - is moving fast forward according to plan. The last concrete elements have been mounted, and as the boulidng has now reached its final hight, the crane can be removed and the roofer can begin his work. On the inside, work is already underway regrading lightweight concrete, floors and installations, and the remaing interior tasks will be initiated come August. 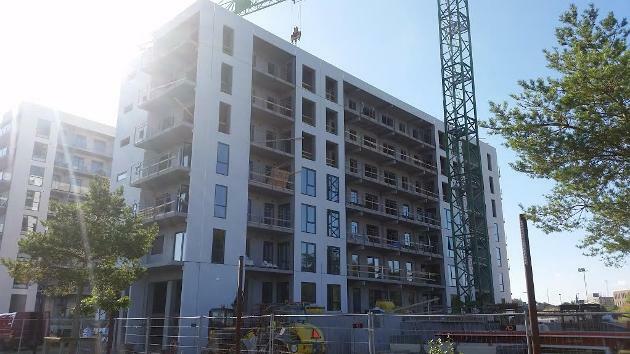 At Lærkevej, the cladding of the facade is now close to complete. It is now possible to get a sense of how the slate facade will look in its entirety. Indoors, all floors have now been cast. 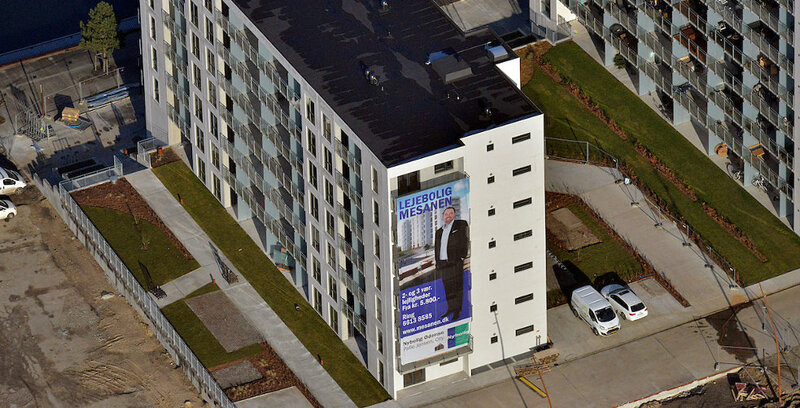 The fifth building at the harbour front in Odense, "Mesanen", has been sold til VHF Holding from Hedensted. VHF Holding will take over the property when it is completed in the beginning af 2017. 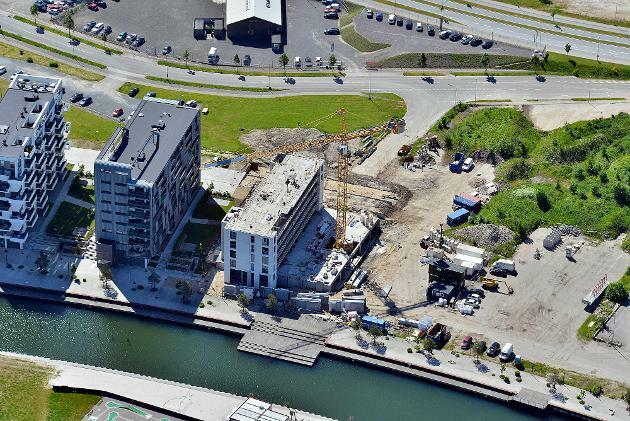 The construction phase is already well underway, and the entrepreneur is Raundahl & Moesby A/S, who has co-owned and co-developed the plot together with IBI. The assembling of the concrete elements has now been finalized, thus the building has now reached its final height and volume. At Lærkevej the crane is busy assembling the concrete elements. We have now reached the 3rd floor. 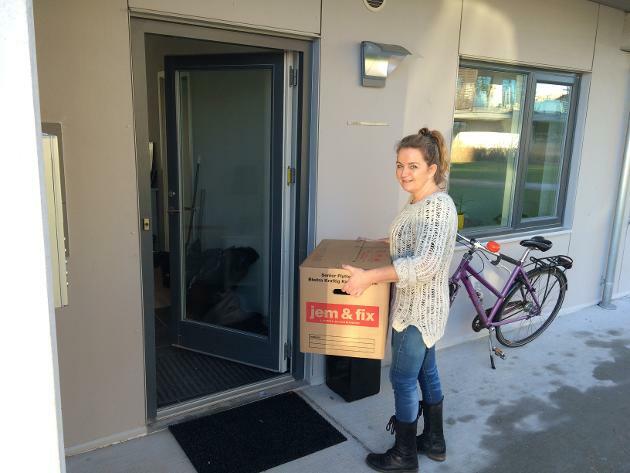 In week 2 we were able to welcome the first residents in Soldækket. The building was handed over at the originally agreed time, and with few comments. 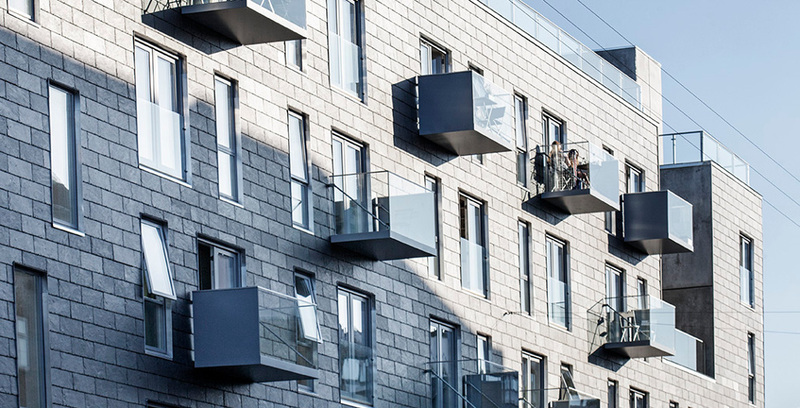 Thus, we are very pleased to see the new residents take over their apartments, filling the building with life. IBI wishes to extend our holiday greetings to all costumers, partners and friends of the house, who have contributed to making 2015 a great year. 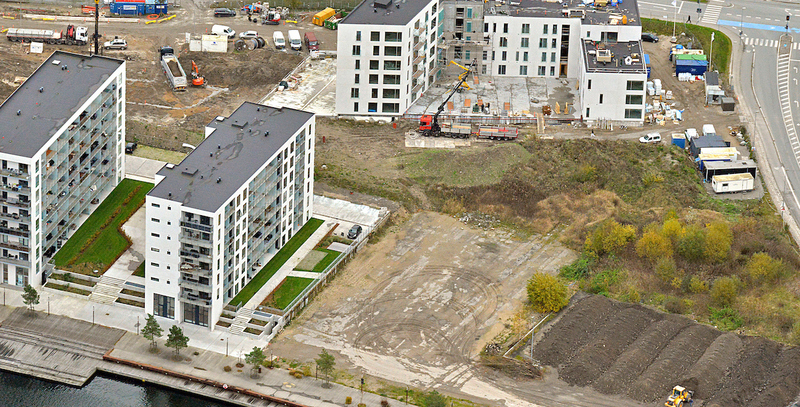 2015 started off with the 67 student apartments on Glentevej being finalized on time, and the project being sold out. 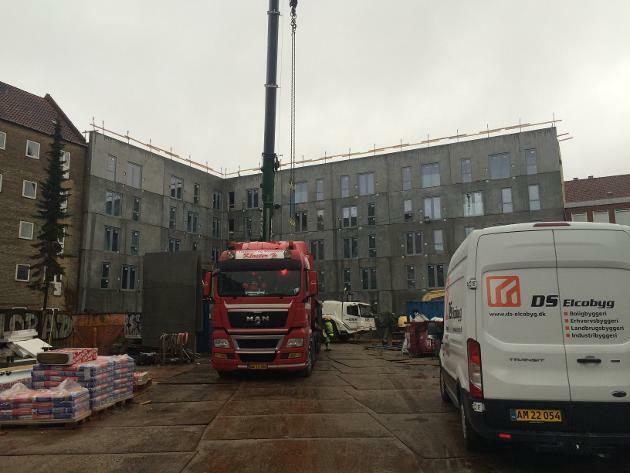 The attractive building was contructed i collaboration with advisor Thormann A/S and turnkey entrepreneur Dansk Bolig Byg. 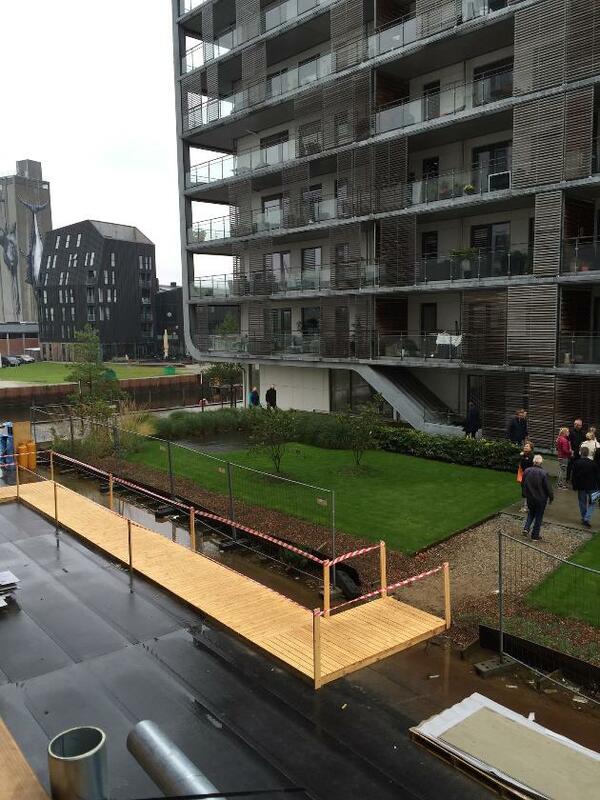 The contruction of Soldækket by Odense harbour started off by yearend, in collaboration with Raundahl & Moesby. Thus, first order of business in the new year is the finalization of the apartments and to hand over the keys to the new residents. Once again, the building is finalized on time, and with a result which we are very proud of. 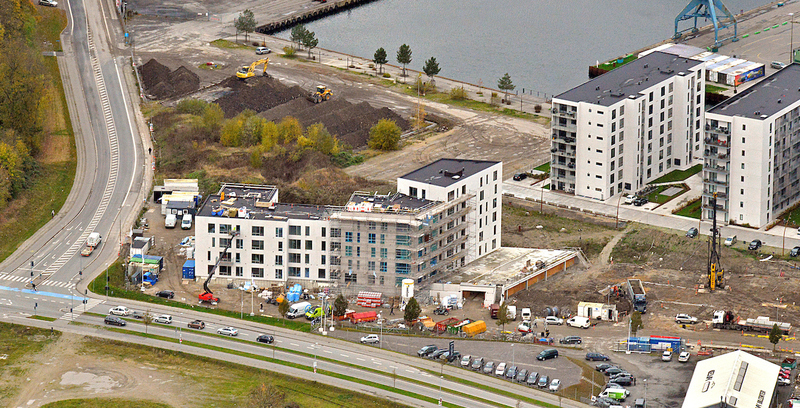 We have also initiated the contruction of the next builidng by the habour - "Mesanen". 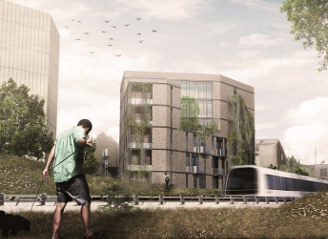 This summer we recieved the building permit for our student accommodation project on Lærkevej 11 i Copenhagen NW. Along with our advisor Thormann A/S and the turnkey contractor Cento A/S, we began the contruction during fall. 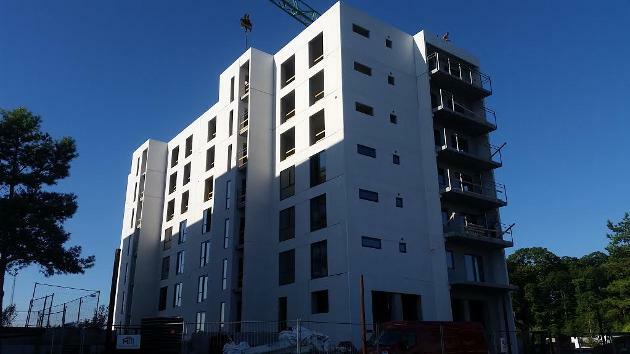 We expect that the 79 apartments will be ready by september 2016. 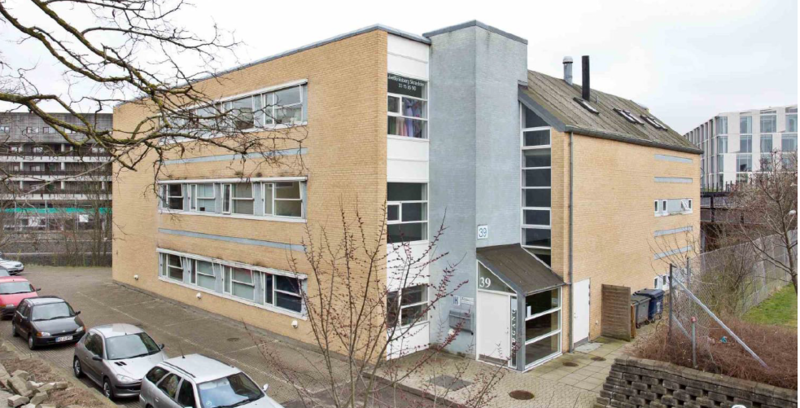 IBI moved our offices to own premises by april, where we took over the property Bernhard Bangs Allé 39 in Frederiksberg. The property houses a number of smaller companies, and will eventually be developed. We wish everyone a merry christmas and a happy New Year, and look forward to even more construction and business in 2016. 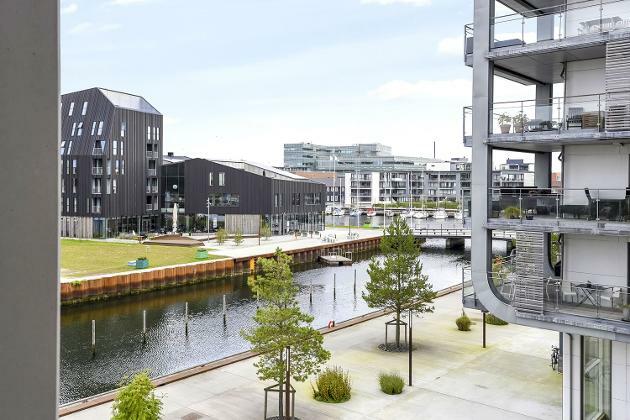 The apartments by Odense Harbour still attract a lot of attention, and our real estate agent from Nybolig, Peter S. Jensen, reveals that 36 apartments are sold at this point. 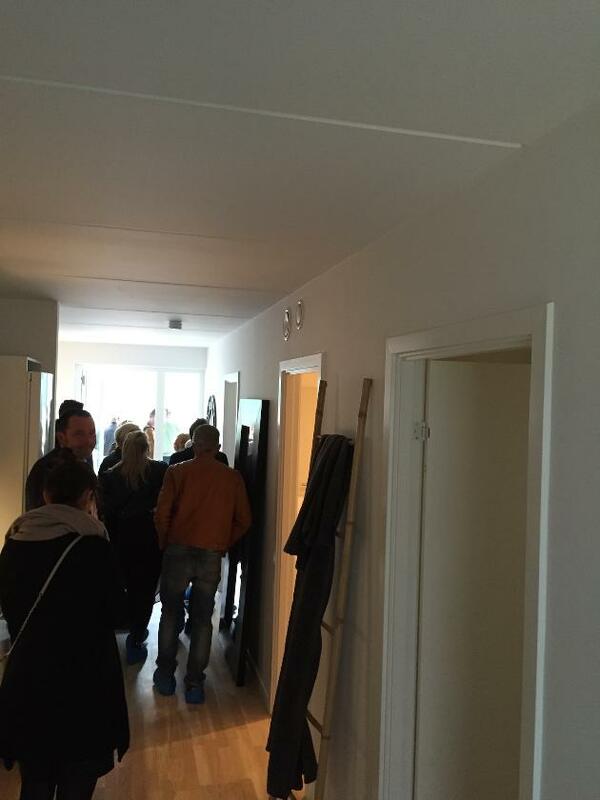 We are very happy with the interest "Soldækket" is met with, and with the many attendees at our open house arrangements. 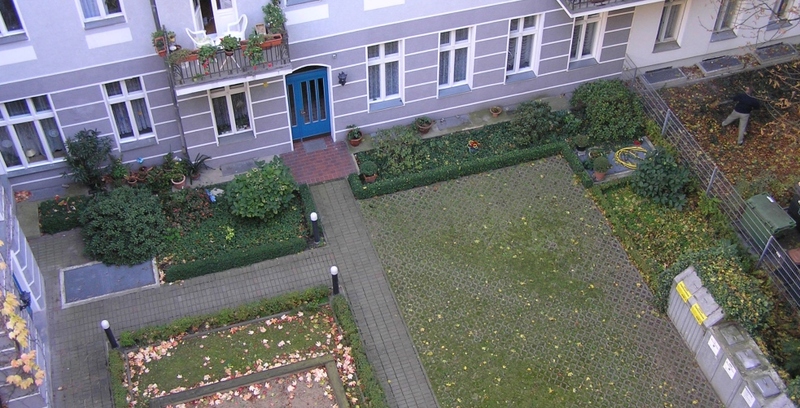 On Sunday the 11th of October, Nybolig once again welcomes you to open house in the two charming test apartments. Everyone is welcome to have a look between 11-13. 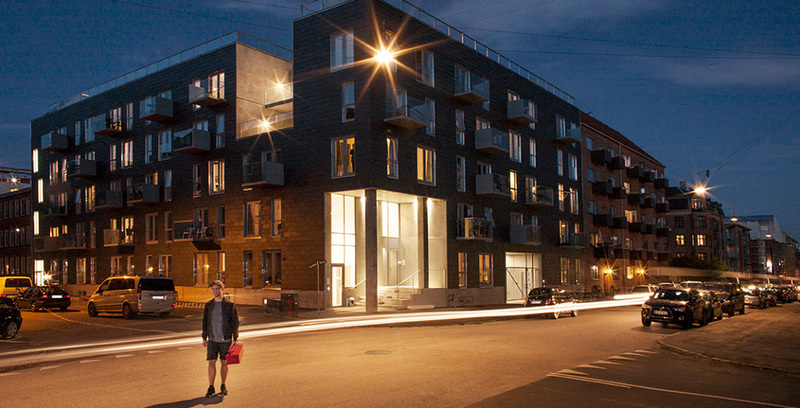 More information on the apartments can be found at www.soldaekket.dk. Also, please contact our real estate agents at Nybolig at 6613 8585 should you have any inquiries. 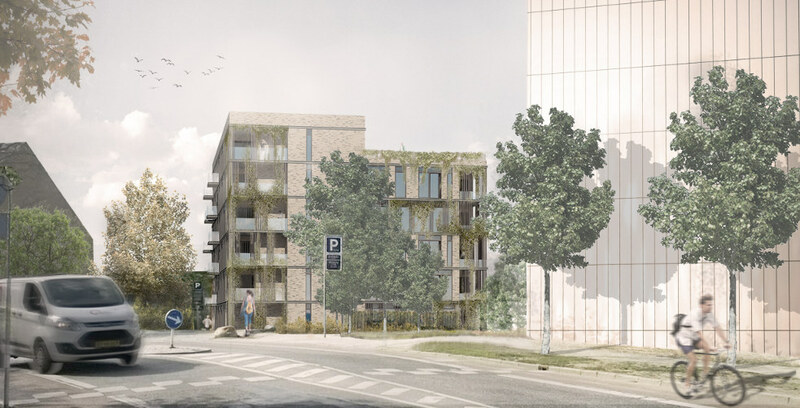 Last week, we recieved the necessary permit to begin the ground work on Lærkevej. Our entrepreneurs are already underway with the establishment of sewers and wells, as well as basement foundations. 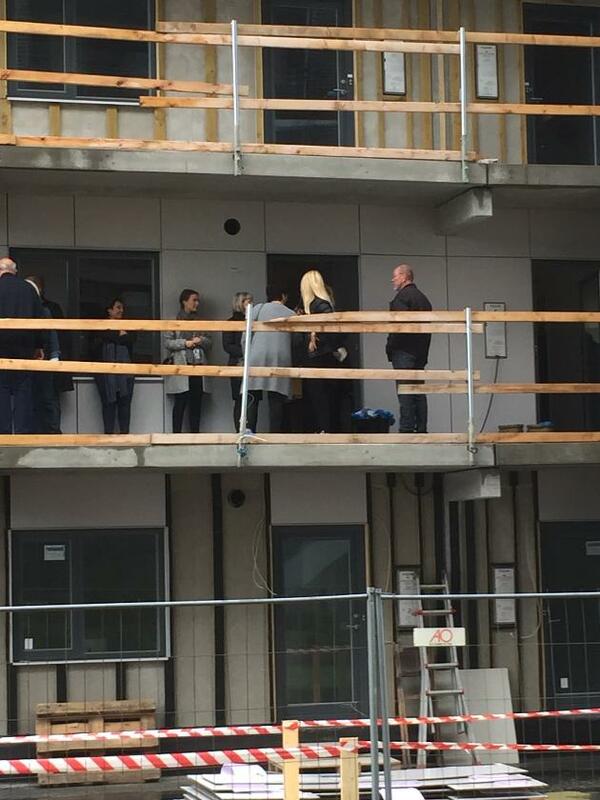 The new test apartments were ready for visitors for the first time on the 16th of September. 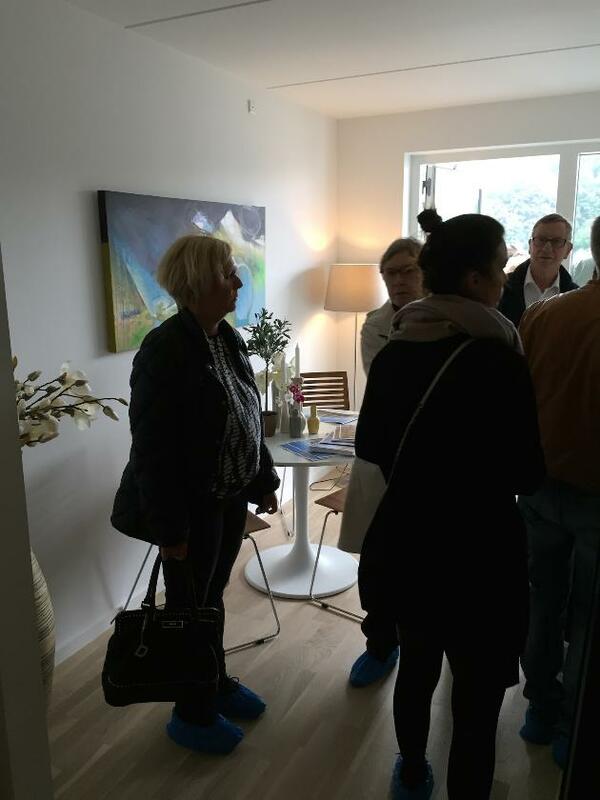 Our real estate agents were busy with the many interested buyers who had shown up, and thus we are very happy with the extensive interest and positive attention we have received. 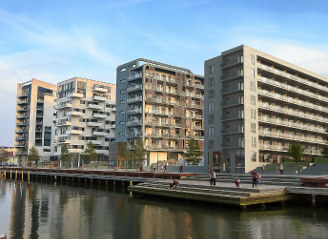 The apartments in Soldækket by Odense Habour are now up for sale. 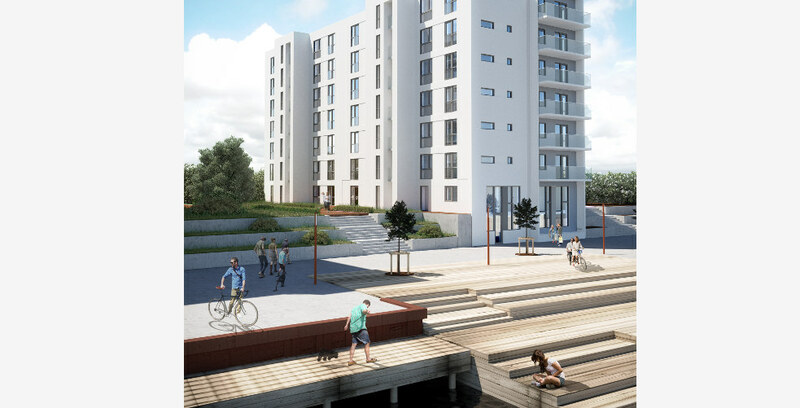 We are delighted that so many have already contacted us and shown interest in the new apartments, and we are happy finally to be able to release the prices. 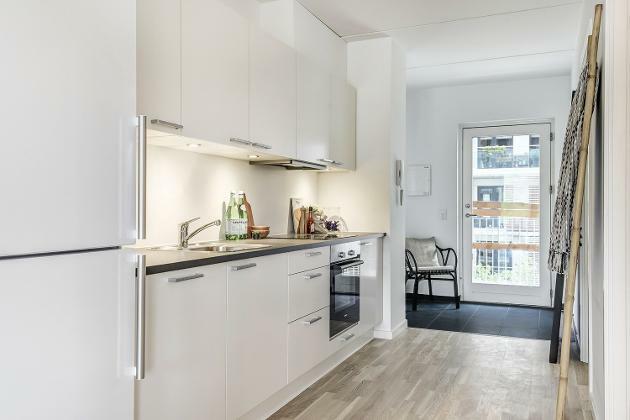 Soon a test apartment will be ready for visitors, and this coming weekend our brokers will bid welcome to open house here for the very first time. 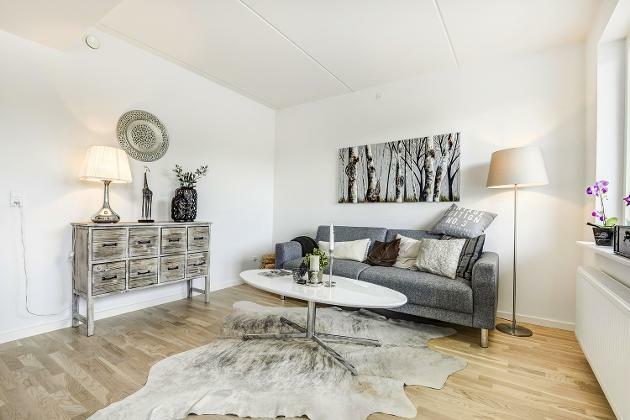 Please contact our brokers - Nybolig Odense C - for more information, and feel free to visit us for the open house arrangement. Summer is upon us, and at this point we are only one story short of assembling the roof and closing the building. We have now begun digging at Lærkevej. The first order of business is to sort and clean up the soil for any polution, before we can begin working on the sewer and foudation. The summer will be spent with these activities, before we can start assembling the concrete elements in the fall. On the 29th of June, the escavation for "Mesanen" was initated, as well as the the screening and handling of the soil. 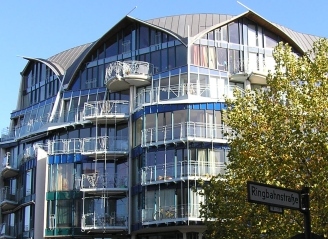 "Mesanen" is the second building which IBI and Raundahl & Moesby build at the water front in Odense, and the fifth building on the promenade. 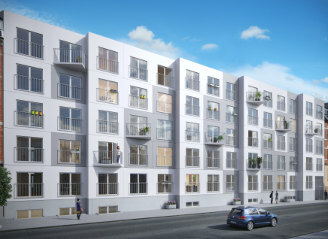 Today, IBI has recieved the construction permit for the student residence project on Lærkevej 11, Copenhagen NW. 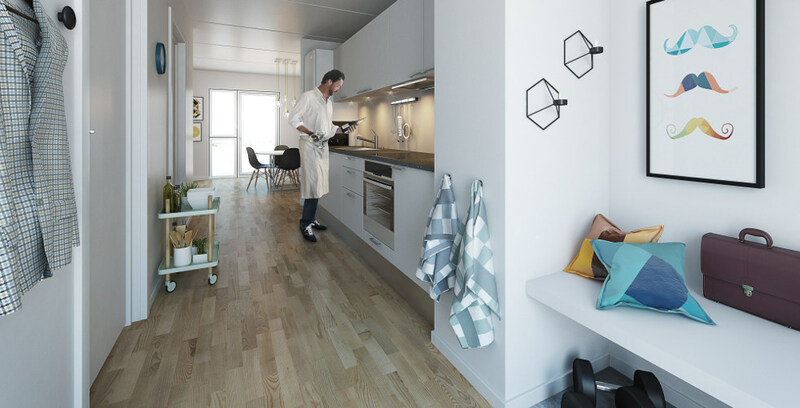 The building will contain 79 one-bedroom apartments with own kitchenettes and bathrooms, as well as common areas and kitchens on each floor. The assembling of the concrete elements is well underway, and we have now reached the fifth floor. 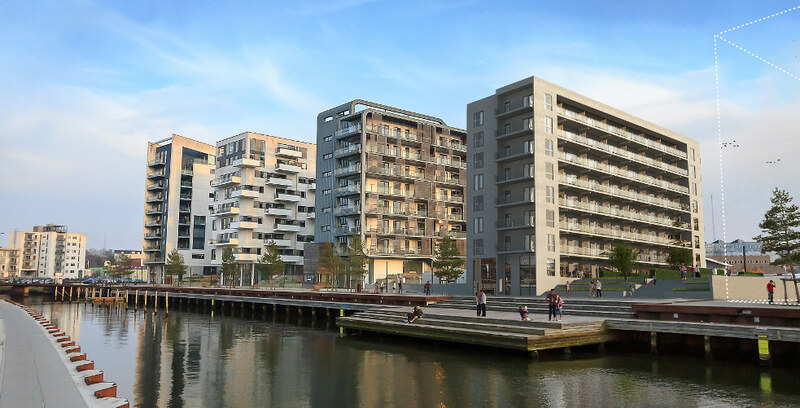 At last, we are able to present to you the new home page for Soldækket - the first building which are are constructing in Promenadebyen, Odense Harbour. 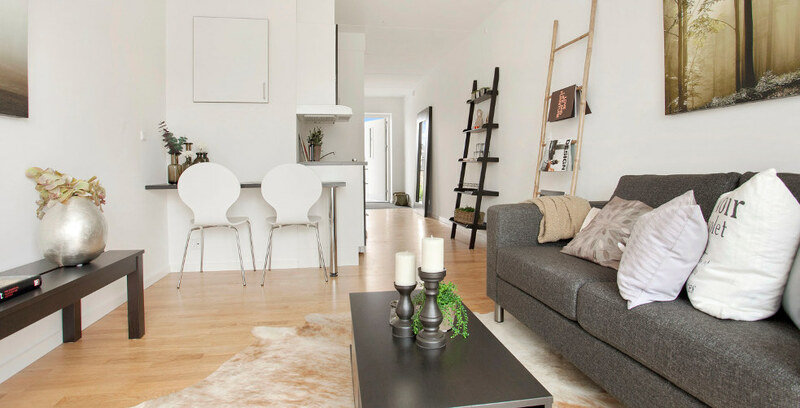 By visiting www.soldaekket.dk, you can se pictures, floor plans and much more. The apartments are not yet on sale, thus not yet priced. (Only in Danish). 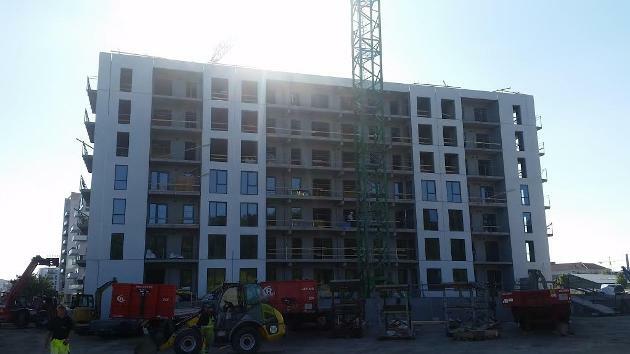 At the habour in Odense, the concrete elements for the underground parking garange and the ground floor has now been mounted. 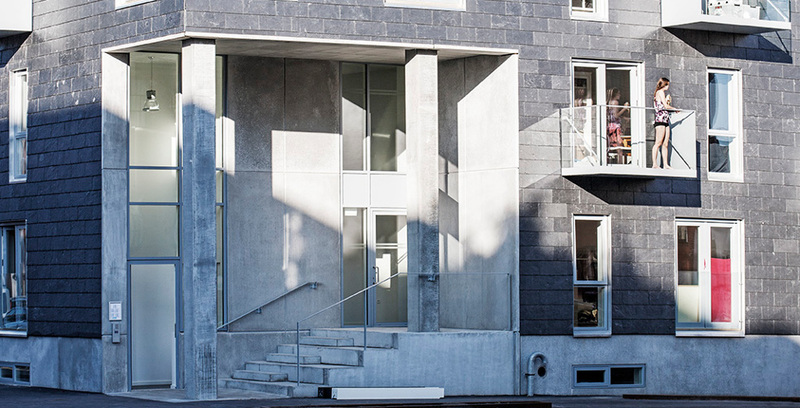 April 1st IBI takes over the property located on Bernhard Bangs Allé 39, 2000 Frederiksberg. It is a office building which currently functions as a multi-tenant office, for severalt smaller companies. IBI will reside here too. 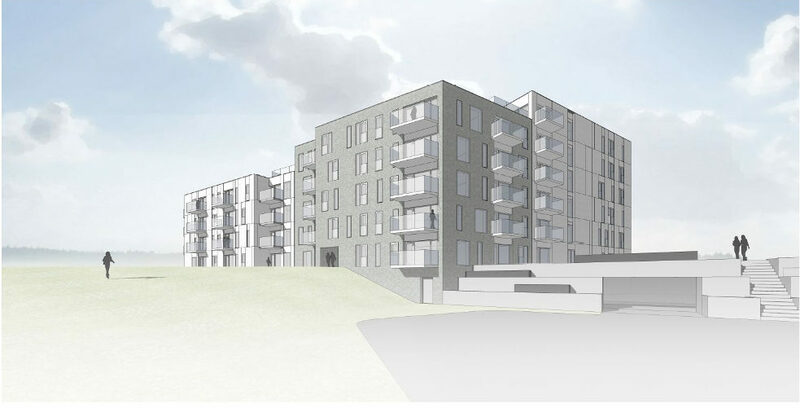 The area in which the property is located, is to one side a exclusive residential area(Femte Juni Kvarteret), and to the other side an up-and-coming area (Flintholm) with several projects under development, both residential and office. The metrostations Lindevang and Flintholm are within walking distance. In time, the property holds great development opportunities. 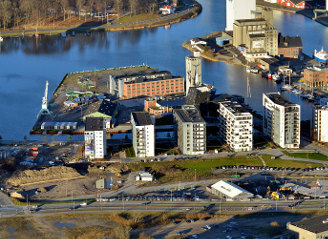 The demolition work has been initiated at Lærkevej, where the old buildings are slowly being brought down and cleansed from any polluting agents. Multiple tests are collected to ensure that the debris is handled correcty. The project planning is well underway, and we expect groud break come spring. 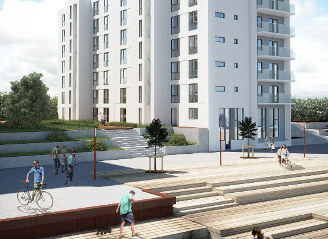 At this time we will start builidng tower number four towards the harbour, which has been named "Soldækket" (The Sundeck). Wednesday the 17th of December, we will start digging. 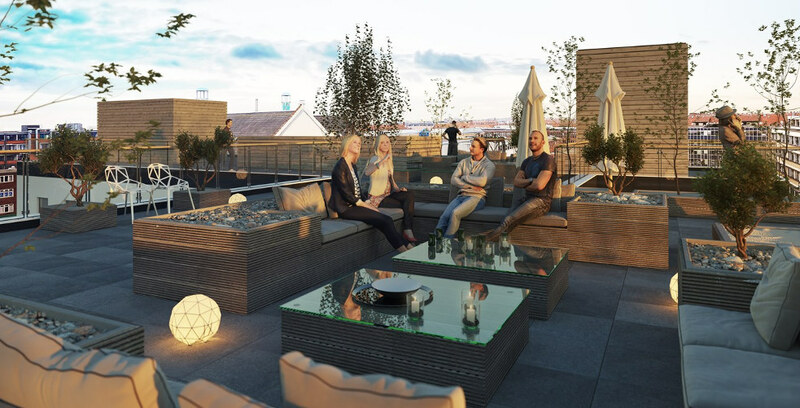 The Sundeck will be eight storeys high with 63 apartments, which will be between 62 and 75 sq.m. We look very much forward to launching the construction phase, which we expect to last about 12 months. 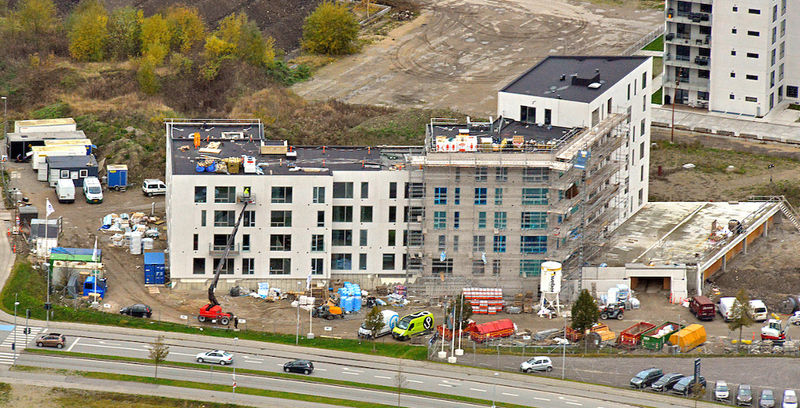 The building is now almost finished at Glentevej. Our skilled craftsmen will soon be putting in the finishing touches. Outside, paving is in process and bicycle sheds are being erected. Inside the apartments only few corrections remain, and in the common areas in the basement the epoxy floor coating is amost ready. We look forward to the 1st of February, where we - as scheduled - will hand over the keys to the many buyers who have purchased aparments. As of now, only 18 apartments of the 67 remain vacant. 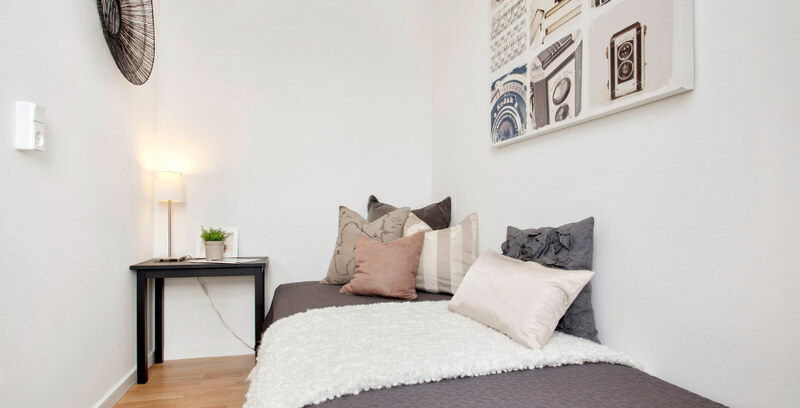 We have furnished a test apartment, so that it is now possible to see how a student apartment in Bolsjefabrikken can be decorated. Our real estate agents from EDC are at the site every Sunday from 12 am - 1 pm, until week 44, ready to show you the premises. Please come by and have a look. At www.bolsjefabrikken.dk you can find floor plans, visualizations and much more (in Danish only). 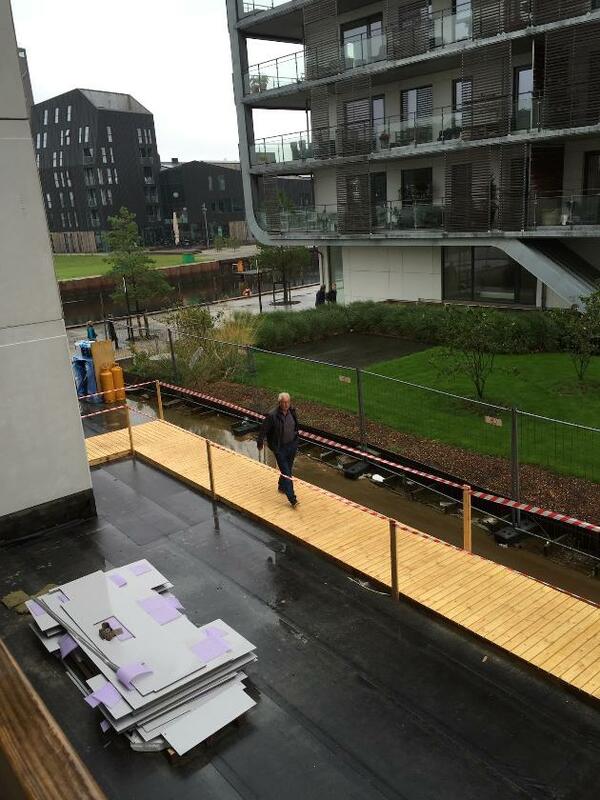 There will once again be activity in Promenadebyen at Odense Habour. 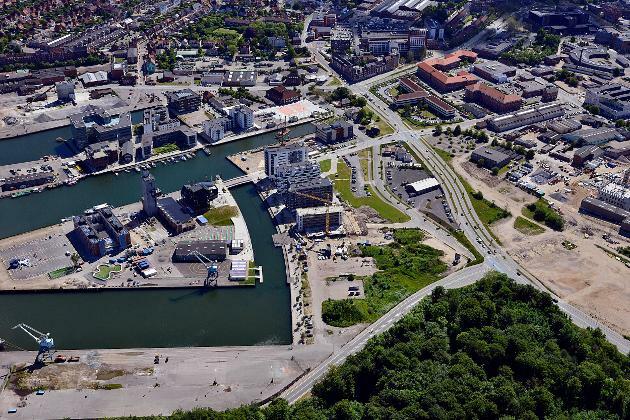 IBI and Moesby & Raundahl has acquired a plot of nearly 27.000 sqm in Promenadebyen, from the bankrupt Sjælsø Gruppen. 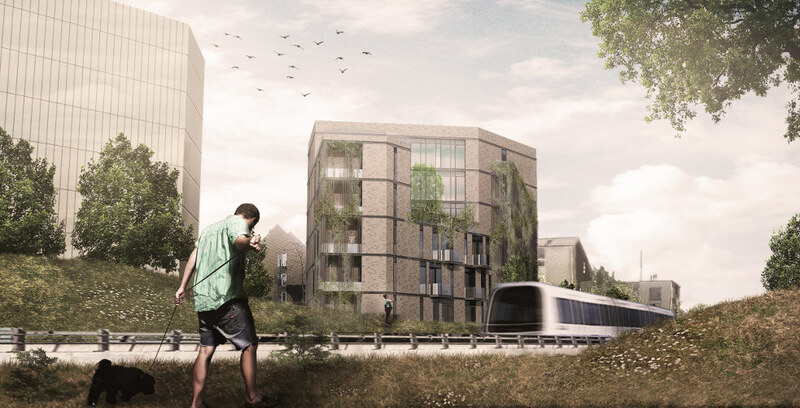 The project will be a collaboration between IBI and Raundahl & Moesby, where the latter has valuable experience from the first finalized parts of Promenadebyen. The new buildings will naturally be designed in a way, which corresponds to and supplements the existing buildings nicely. 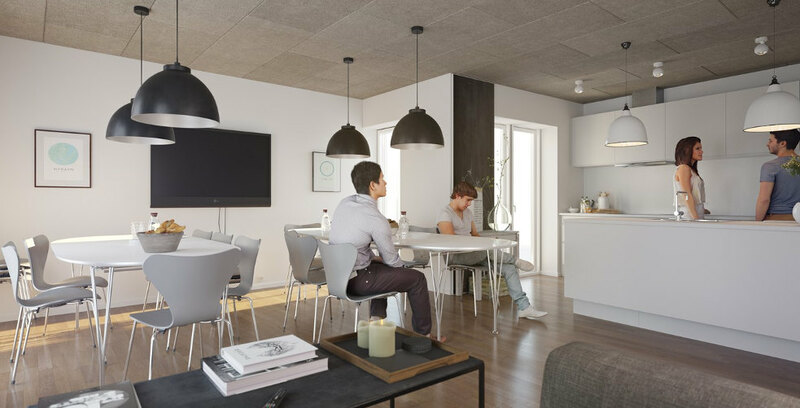 The location of the project - near the railway station, the city centre and not least the new campus under construction - makes apartments here extremely attractive, especially for students. The property has been bought as of July 1st, and during the summer we will work on designing the project. 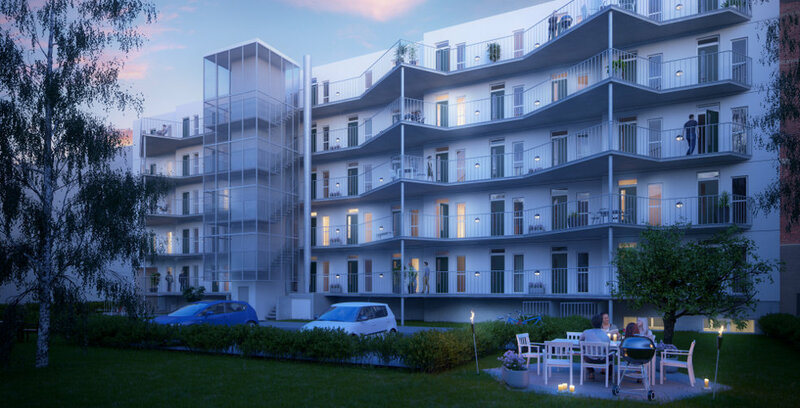 We expect to start the construction phase in the autumn of 2014. IBI har i dag overtaget ejendommen Lærkevej 11, København NV. Intentionen er at opføre ungdomsboliger her, efter samme model som på Glentevej. Vi er i dialog med myndighederne for at fastlægge projektets udformning, samt ansøge om at nedrive de eksisterende bygninger. 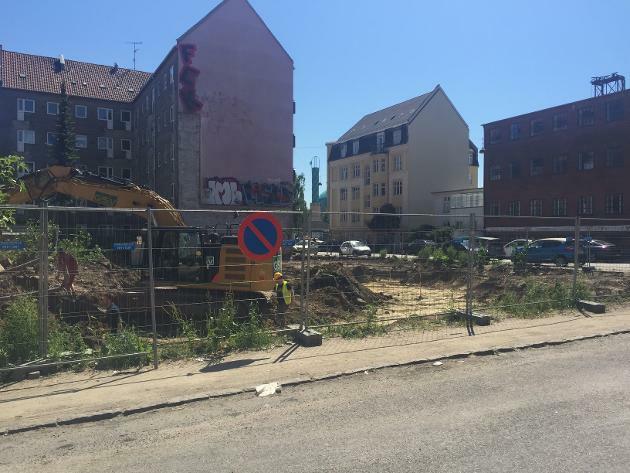 Byggepladsskiltet for Bolsjefabrikken er nu på plads på Glentevej, og vi glæder os over at IBI-logoet efter mange års fravær igen er at se i gadebilledet.